Annual van production at Sevelsud could rise from about 300,000 units per year to about 350,000, a union source said. 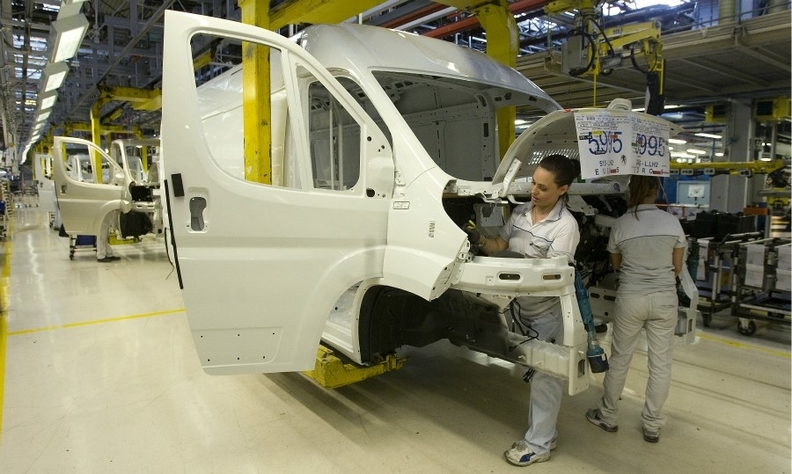 PARIS -- PSA Group and Fiat Chrysler Automobiles have extended their agreement to build large vans at the Sevelsud factory in Italy through 2023. The factory in Val di Sangro, in southern Italy, produces the Fiat Ducato, Peugeot Boxer and Citroen Jumper. Opel and Vauxhall versions will be added as PSA integrates Opel/Vauxhall vans into its lineup. Production capacity could be increased through added shifts, the companies said. An Italian union source said that the current 15 weekly shifts could grow to 17 or 18, raising annual production from about 300,000 units per year to about 350,000. The Sevelsud partnership dates to the late 1970s, with the plant in Italy inaugurated in 1981. It now employs 6,200 people. In addition, PSA said large vans could also be built at other group production sites. The current Opel Movano large van is now built by Renault at its factory in Batilly, France. "We are currently investigating different scenarios to satisfy commercial demand," a PSA spokeswoman said, adding that no further details were available. PSA Group currently produces midsize vans at Luton, England, and Hordain, northern France. The Hordain plant was part of the original Sevel agreement, but the PSA-Fiat partnership at the plant dissolved in 2012, with PSA taking over 100 percent of operations. PSA is counting on higher light-commercial vehicle sales and profits as part of its Push to Pass 2021 strategic plan. Last year the group introduced new small vans, including Opel and Vauxhall Combo variants, and started production of midsize Peugeot and Citroen vans at its factory in Kaluga, Russia. PSA is also benefiting as Opel/Vauxhall vans are moving to its platforms. In addition to the large Vivaro and small Combo, formerly built with Fiat Chrysler in Turkey, the midsize Vivaro will move from a Renault platform. In 2018 PSA sold 564,147 light-commercial vehicles, an increase of 18 percent year over year, but that figure includes full-year Opel/Vauxhall sales for the first time.